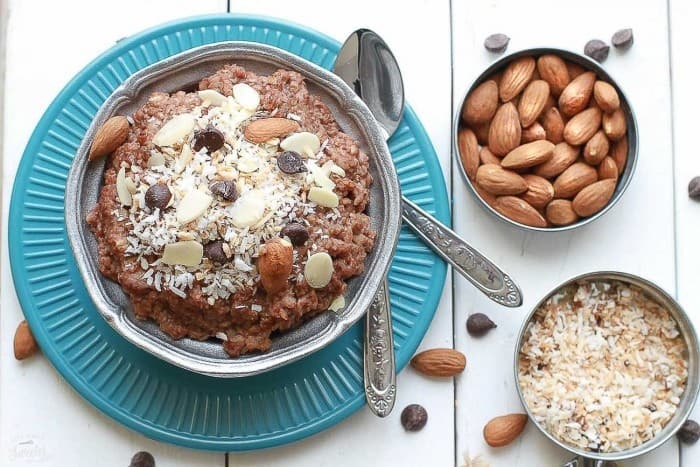 Chocolate Coconut Almond Overnight Oats – A healthy, fun and simple recipe. Just throw all the ingredients into a jar and let it sit overnight for an easy grab-and-go breakfast! So now that the weather is warmer, I’ve swapped out my usual bowl of oatmeal back over to overnight oats. Have you tried them yet? They are are by far one of my favorite easy breakfasts and make rushed mornings a breeze because they are ready to grab and go in the morning. You just combine everything into a resealable jar or container, mix it up, and let it soak overnight! 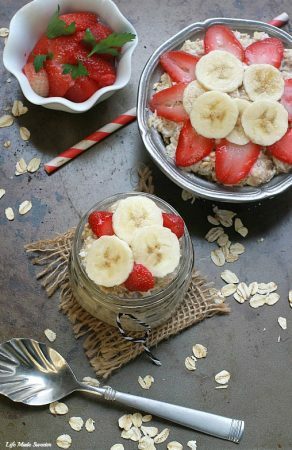 Then come morning time, you can quickly grab your jar of fully prepped oats amid the morning madness and eat them on your way to work or while getting ready. You can heat them up before digging in or enjoy them cold, right out of the fridge. My favorite thing about overnight oats is that they’re so simple to make and you can customize them with whatever flavors you like. I love enjoying my overnight oats right after my morning workout before the kiddos wake up. It’s that special “me time” for fueling up with a healthy and delicious breakfast. 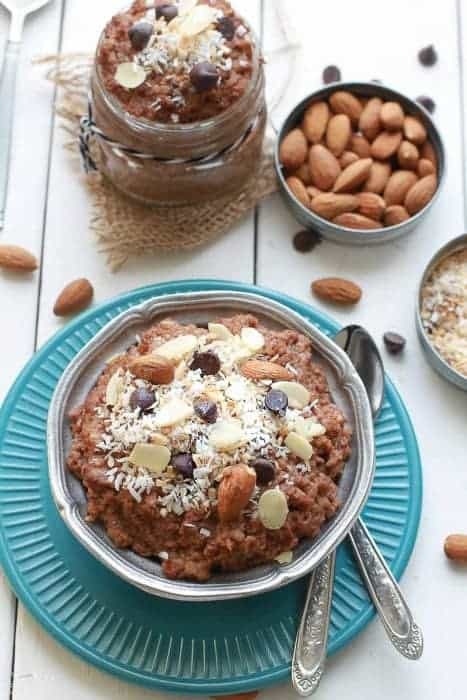 This Chocolate Coconut Almond Overnight Oatmeal only takes 4 ingredients to make and combines many of my favorite things….one of them is Nutchello’s Dark Chocolate + Walnuts . 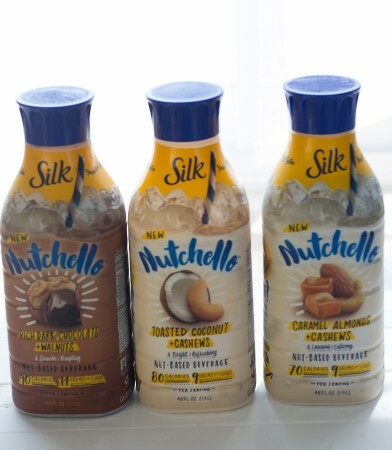 We enjoyed Nutchello so much in our morning smoothies that we couldn’t wait to try them in the rest of our breakfast routine. For a creamier texture, use a 1 to 1 ratio or if you prefer your overnight oats thicker like mine, use a little bit less liquid. These Chocolate Coconut Almond Overnight Oats are a healthier breakfast disguised as dessert. Garnish with your favorite toppings and just grab a spoon! 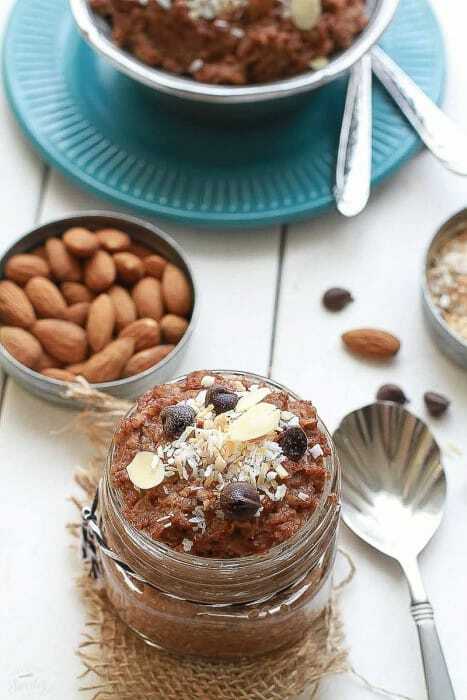 Chocolate Coconut Almond Overnight Oats - A healthy, fun and simple recipe. Just throw all the ingredients into a jar and let it sit overnight for an easy grab-and-go breakfast! Combine all ingredients into a mason jar or resealable container. Stir well and seal. Remove from fridge and serve cold or warm up in the microwave to serve hot. This post is sponsored by Silk. All opinions are my 100% own. Visit here for a .75 cents off coupon!